Words and photos by Katrina from Russian Revels and myself. The World’s End Market is the second venture of the Markets Group which opened The Crystal Palace Market restaurant earlier last year. The Group set out to introduce ‘an innovative culinary concept’ to the competitive London restaurant scene by focusing on unfussy cooking using the best quality local ingredients, with the result being primarily grilled fish and meats with classic sauces. The World’s End Market used to be an iconic pub which has been lovingly restored. Today it retains much of the atmosphere of a good old boozer. The interior design is reminiscent of an early 20th century canteen decorated in cosily hushed greens with a gleaming cocktail bar and easy-listening background music. On a Monday evening the restaurant was uncharacteristically quiet because of an important football game (so we were told by the charming French manager), but the loveliness of the restaurant no doubt can draw in the crowds on other nights of the week. We felt we could easily have spent many an hour drinking from a decent selection of wines, most of which were organic. The concept at World’s End Market concept centres on ‘locally sourced ingredients’, and although the restaurant does not list the source of all their protein the locavore concept didn’t quite hold true as we saw scallops from the Pacific and prawns from Madagascar. 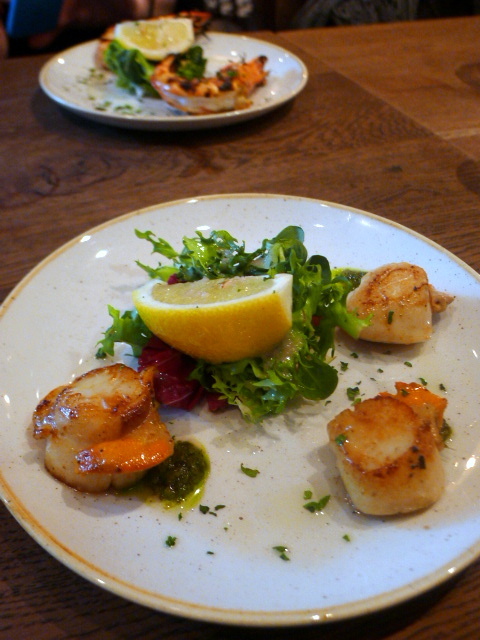 But we tried these for our starters, and we found that we loved the plate of simply grilled scallops (£10.50). Three plump molluscs, with roe intact, were well cooked and served with a zingy dressing. This dish was one of our favourites. Medlar Restaurant is a rustic little number on Kings Road occupying the site that was once Vama Restaurant. It serves French ‘style’ food, but as the Medlar website states it also draws inspiration from “all over”. The restaurant was founded by a couple of experienced old hands of the restaurant trade. Head Chef and owner Joe Mercer Nairne honed his skills at Chez Bruce, The Savoy Grill and the big hitting Sydney restaurant Rockpool, and front of house is run by his business partner David O’Connor who was previously at The Square and The Ledbury. A reading of the Medlar menu suggests food that is warm and satisfying, and the simplicity of the soft greyish tones of the restaurant décor goes a long way in supporting an experience of comfort. The three-course set menu consists of eight options per course and is priced at £45 for dinner from Monday to Saturday. But the same menu is available during lunch and on the weekdays it is even better value at £27 (Saturday lunch- £30, all day Sunday – £35). 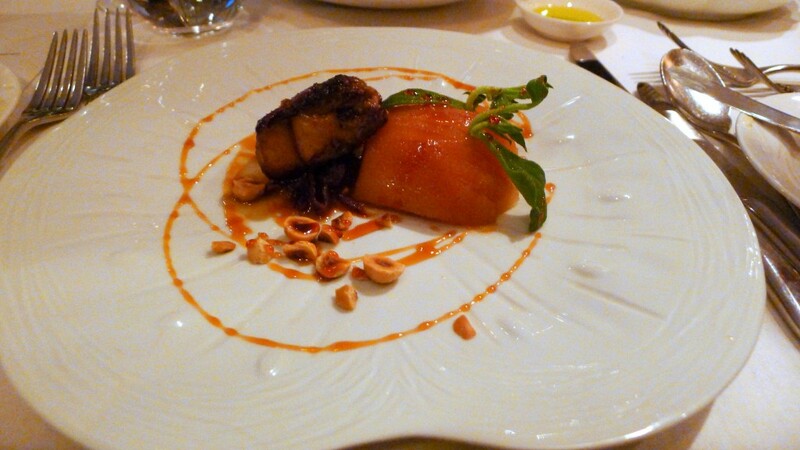 We started with the roast foie gras (+£3 supplement) with poached quince. The foie gras was incredible, being beautifully soft, lusciously rich and satisfyingly decadent. The poached quince had been nicely done and worked well with the foie gras, and a drizzling of sherry vinegar caramel was excellent giving way to a perfect touch of acidity. Finely chopped hazelnuts texture and a nice finishing touch. My only wish was a bigger piece of foie gras as it was quite small. Our visit to The Henry Root was a bit of a surprise visit. We were meant to be eating at Elleven Park Walk, an Italian restaurant (on 11 Park Walk in West Brompton), but a power failure at the restaurant meant that we turned up only to discover that there was no food to be had. The restaurant was nice enough to comp us a glass of champagne for the inconvenience, but thereafter there was no point staying. 11 Park Walk use to be the home of Aubergine, a Michelin-starred restaurant that closed in 2010. I had a disastrous meal at Aubergine in 2009 and it was just as well it closed as it seemed to be on its last legs. Two times unlucky. This address must surely be jinxed for me. Anyway, that is how we ended up at The Henry Root which is right next door at 9 Park Walk. Named after the pseudonym of writer and satirist Charles William Donaldson, The Henry Root must be the most darling of neighbourhood restaurants that you could ever hope to come across. Homely and cosy are the words that immediately spring to mind when you enter The Henry Root. Warm subtle tones run throughout the restaurant which is wonderfully light and airy. Good use has been made of the space and the dining area feels quite roomy. The menu was a more accomplished read than I had initially expected. I thought its style would be more café-type food, but instead we were presented with dishes like seared scallops with grilled chorizo, roasted red peppers and sweet basil (£10). The scallops were beautifully cooked, and there was a real depth of meaty spicy flavour coming through from the chorizo. 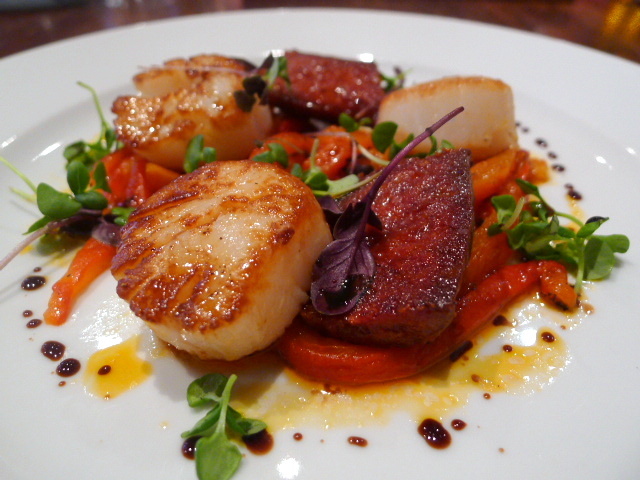 However, the chorizo was a touch overpowering against the delicacy of the scallops. The peppers were also well done, proving to be soft and sweet. A recent Sunday lunch at Sophie’s Steakhouse in Chelsea revealed it to be a noisy family affair with swarms of children flying around. I adore kids, but if you’re looking for a quiet relaxing Sunday lunch, the Chelsea branch of Sophie’s Steakhouse might not be the best place to head. The fact that service wasn’t at its most efficient didn’t help either. The restaurant could probably have done with more front-of-house staff. 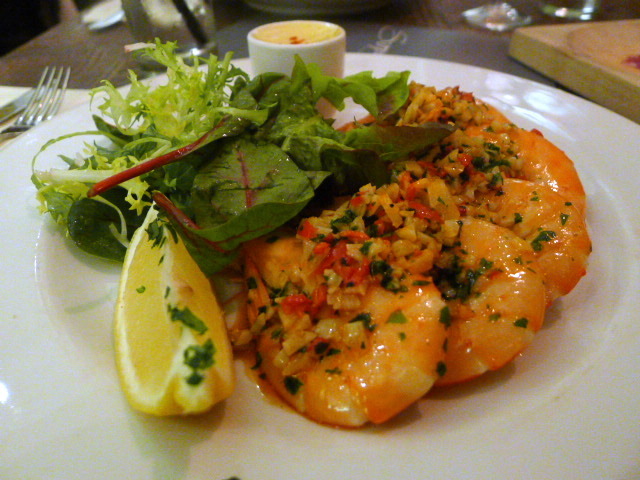 We kicked off with some pan-fried king prawns (6) with chilli & garlic (£14.95) which were of a decent quality. But the prawns were under seasoned and not particularly garlic-y. Chutney Mary is an up marketing Indian restaurant in Chelsea which focuses on Indian cooking from six different regions. 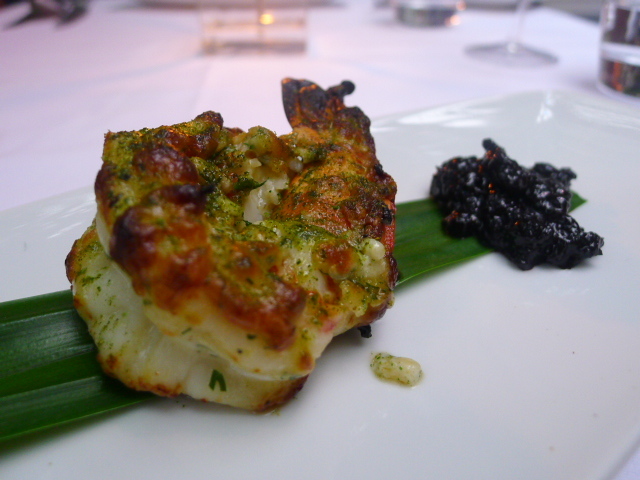 The last time I went to Chutney Mary I tried the tasting menu for £45 which I enjoyed (to read that post click here). The service was polished and all around the food was very enjoyable although I had wanted a bit more spicing and a little more veg. But the food was good enough to go warrant a another try and this time around I again went for the tasting menu (still priced at £45). A generous piece of nizami tandoori prawn chargrilled in roasted seasame, fresh dill and a Kerala white pepper marinade was resplendent with flavour. It had been cooked beautifully, and was moist, plump and juicy. The delicate hints of chilli thrown into the mix had been expertly judged. It was served with a wonderful blueberry chutney made with curry leaf, mustard and garam marsala which gave way to a zingy mix of complex flavours and spices. In some respects, L’Art du Fromage is the most interesting opening to hit London this year. As the name suggests, the restaurant specialises in cheese, which you will find in virtually every dish on the menu. It might be a bit hard to imagine eating cheese with every course, but you have to admit the idea is novel. La Cave à Fromage in South Kensington offers cheese and wine tastings every other Thursday, but L’Art du Fromage is the only restaurant of its kind in London to make cheese a core ingredient. The restaurant is the brainchild of two 24 year-old Frenchmen, Julien Ledogar and Jean-Charles Madenspacher, both from Alsace. L’Art du Fromage stocks some 100 cheeses which are brought in weekly from Lyon, a lot of which are proudly on display as you walk into the restaurant. The restaurant is quaint, simply furnished, small and cosy. Situated on Langton Street, off the Kings Road in Chelsea, it shares the same street as that favourite haunt of the well-heeled, La Famiglia. 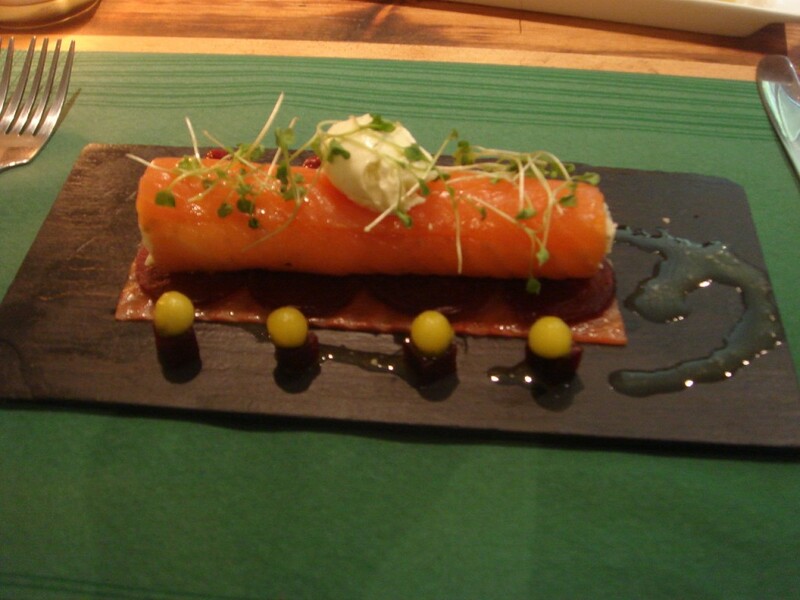 We started with smoked salmon and goat’s cheese roulade with fresh herbs and beetroot carpaccio (£6.40). There was a little too much goat’s cheese relative to the amount of smoked salmon on the plate, but otherwise the roulade was lovely. The classic combination of goat’s cheese and beetroot worked a treat, with the sweetness of the root vegetable cutting the creamy richness of the cheese nicely. The cheese accentuated the smoky sweetness of the fish. 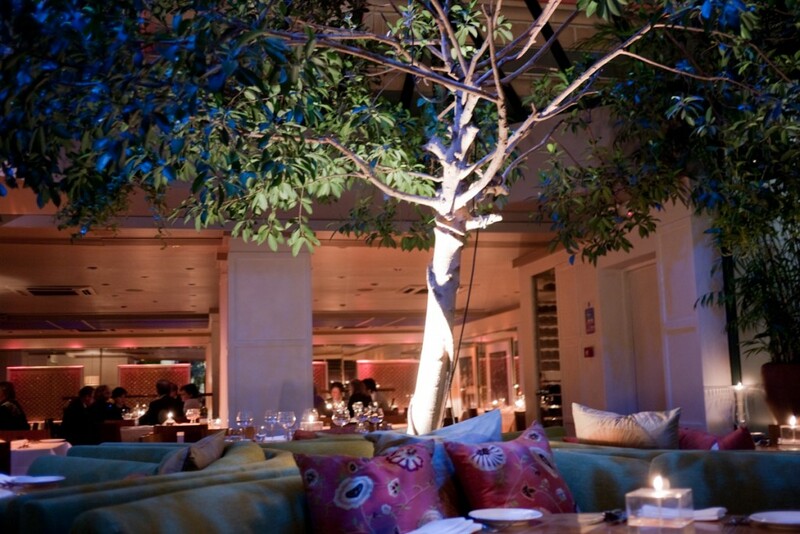 Like restaurants such as Benares, Amaya and Rasoi, Chutney Mary falls into the category of Indian fine dining. It doesn’t possess a Michelin star, but it does have a New King’s Road location, fine cutlery service, a luxurious decor and prices that are ‘higher than-your-local-Indian’ to make it worthy of a fine dining classification. We settled on the 6 course tasting menu which is priced at £45. First up was a scallop caldeen. 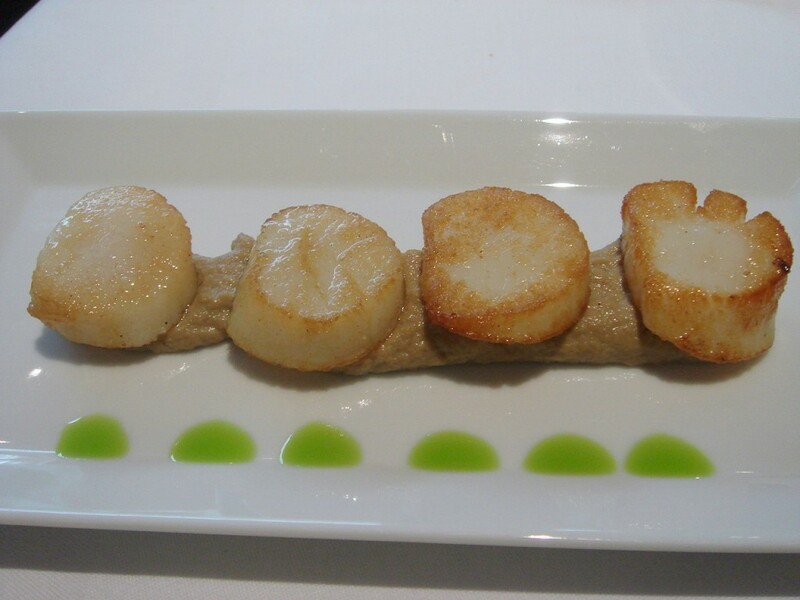 A fat, succulent piece of Atlantic scallop, it had been cooked to a beautiful doneness that left it with an opaque sheen. The accompanying caldeen sauce had a lovely cumin and coriander kick to it, and it worked with the tomato and ginger salsa that dressed the top of the scallop. This was a masterful display in spicing and flavour matching. This starter was served with some lovely, fluffy naan bread. My latest lunch adventure was at Aubergine Restaurant, which is perhaps most famous for the fact that this was where Gordon Ramsay won his first Michelin star in 1995 and a second in 1997. A desire to own his own restaurant coupled with differences with the owners resulted in Ramsay leaving shortly thereafter to open what we now know as Gordon Ramsay on Royal Hospital Road. In Ramsay’s place stepped the current Executive Head Chef, Billy Drabble. He too soon attained a star which he has managed to hold onto ever since. So I came to Aubergine with an element of curiosity, inspired by its history more than anything else. But under Drabble, Aubergine has also collected its share of accolades. Since 1998, along with its Michelin star, it has also continuously held onto 4 AA Rosettes. 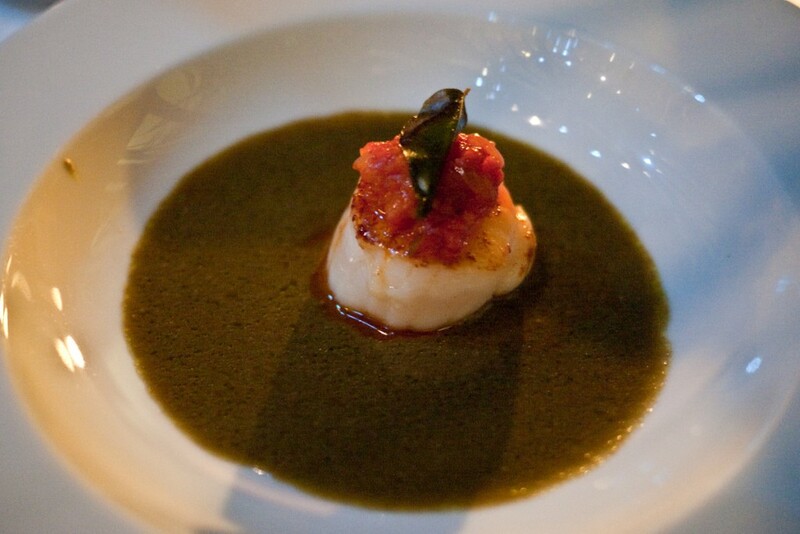 And in 2006 it won the ‘Grand Prix of Gastronomy’ as awarded by The British Academy of Gastronomes.